French presidential candidate Emmanuel Macron's political campaign was targeted by a group of Russian hackers last month, according to a report by a cybersecurity research group Tuesday. The Pawn Storm group, which has been linked to several high-profile attacks in the West, used "phishing" techniques to try to steal personal data from Macron and members of his En Marche! campaign, Japan-based Trend Micro said. Pawn Storm, also known as APT28, is also believed to be behind the attacks last summer on the US Democratic National Committee, thought to be aimed at undermining Hillary Clinton's presidential bid. 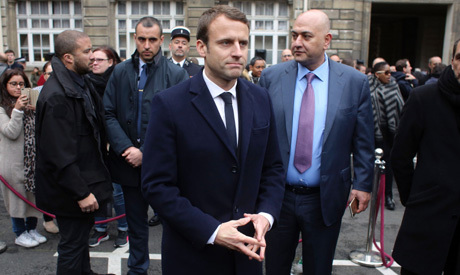 It is widely suspected of having links to Russia's security services, and Moscow has been seen as a keen backer of Macron's rival in the presidential race Marine Le Pen, who met President Vladimir Putin in a surprise visit to Moscow ahead of the vote. But on Monday, Russia denied any involvement in the French election. "Which groups? Where do they come from? Why Russia?" Kremlin spokesman Dmitry Peskov said. "It resembles the accusations made by Washington which to this day remain hollow, and they do no honour to the people making them."